Thatched Cottage of Du Fu It lies by the side of the Huanhua Stream in Chengdu‘s western suburb. It was the residence of Dufu, the great poet of the Tang Dynasty when he took refuge in Chengdu. Du Fu (712-70 AD), one of China‘s most famous poets, left home at the tender age of 20, becoming a court official at the former capital in Chang‘an (near Xi‘an). Don‘t expect to see anything in the cottage that belonged to Dufu. What we see today is the reconstruction of the Ming and Qing dynasties. The cottage is located in the western suburb of Chengdu. All these give the place an atmosphere of solemnity, meanwhile a sense of beauty and grace. Around the hones are bamboo fences and inside the fences are vegetables and herb plots, easily remind people of the scenes described in Dufu‘s poems. While taking a quiet walk in such a historical and cultural environment, visitors are apt to be brought back to the ancient times. Wangjiang Tower Park It was built during the Guangxu Reign of the Qing Dynasty, located at the southern bank of the Jingjiang River, two kilometers from Chengdu city, known as Chongli Tower. The tower is a four-floor structure more than 30 meters in height, with the two lower floors laid out on a square plan and the two upper floors assuming a pentagonal shape. The building‘s beauty of architectural detail is entailed in its sumptuous look. Right beside the tower is the well from which the celebrated Tang dynasty woman poet, Xue Tao, fetched water. Buildings, and a vast bamboo grove surround the tower. 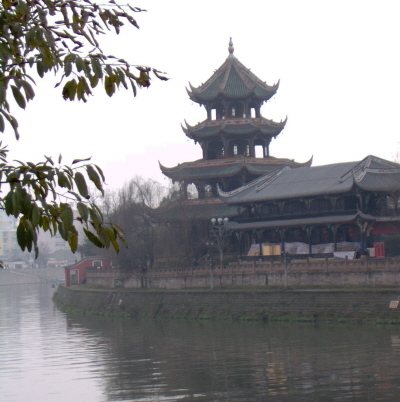 The Wangjiang Tower is a landmark in Chengdu. Wangjian Tomb Wangjian Tomb, historically named Yongling Mausoleum, is situated in the northwest suburb of Chengdu city. Wangjian (847 - 918) was a general of the Tang Dynasty. At the end of the Tang Dynasty, in order to avoid the frequent wars, he followed the Emperor Xizong to Sichuan province. After the collapse of the Tang Dynasty in 907, Wangjian established the Former Shu kingdom and capitalized Chengdu. Formed by a series of 14 double stone vaults, the 23.4-meter-long coffin chamber consists of front, middle and back rooms. The coffin platform is flanked by open carvings of 12 men of unusual strength and carved with relief of 24 musicians and dancers on the east, west and south sides. Of all the cultural relics unearthed in China, the 24 musicians and dancers form the best-preserved royal band of the Tang dynasty. The stone sculpture of Wangjian, sitting in a relaxed manner but still with a dignified look of an emperor, is kept in the back room. Renmin Gongyuan is a charming and very typical Chinese park. Situated in the southwest of the city, this is a great place to relax and soak up some atmosphere while watching the tai ji or wushu enthusiasts work out. The park consists of a pretty bonsai garden, a children‘s funfair and a Monument to the Martyrs. These sites are all situated around a lake where you can hire pedal boats. The nicest way to see the park is just to spend some time wandering around and taking in the ambience of the city. The gates open here at 6.30 am when the martial arts enthusiasts move in, and close at 2am to allow for dancing to take place in the park squares. Perhaps the best thing about this place however, is the wonderful teahouse in the grounds. Tea houses abound in this city and this is a particularly popular one with locals who come to sip, chat and stay all day!